Aqualyte is a rapidly absorbed fluid and electrolyte replacement solution for workers and athletes performing in hot environments. It is scientifically formulated on published scientific research to be the premium fluid and electrolyte solution. Aqualyte is a HYPOTONIC solution which studies have shown are more effective than isotonic drinks or plain water which means Aqualyte will move from the gut into the blood supply over 50% faster. 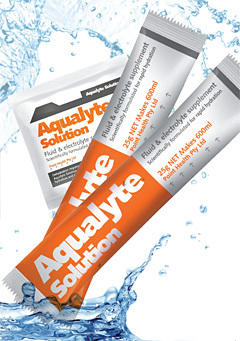 The composition of Aqualyte has been specifically formulated based on the electrolyte composition being lost in sweat. This not only ensures the osmolality of Aqualyte is HYPOTONIC but it helps maintains the body’s normal electrolyte balance which facilitates thermoregulation and optimal neuromuscular performance.